Last Thursday my bride and I went to a book sale in Normal, Illinois. There I found something highly unusual: a one volume history of the Civil War that I was unaware of. 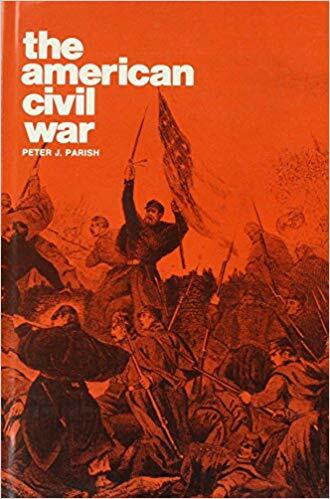 Written by Peter J, Parish, then a Lecturer a the University of Glasgow, The American Civil War came out in 1975, the year I finished high school and started college. I try to keep abreast of the vast sea which is the scholarship on the Late Unpleasantness, so I assumed that the book would probably be a dud which deservedly quickly slipped into oblivion. That assumption could not have been more mistaken. As a one volume study of the War it ranks with the top levels occupied by McPherson, Catton, Pratt and a few select others. Condensing that vast conflict to one volume is a major challenge for any historian, and giving some new insight into it is even more so. Most one volume histories of the War tend to be highly superficial and merely regurgitate the basic facts with little skill. Parish in his 750 pages sheds new light on a subject that I know almost by heart and writes with considerable understated verve. An Easter egg at the end is a superb bibliographical essay in which he demonstrates his mastery of the secondary sources of the Civil War. I am pleased to see that it may be purchased at a very reasonable price on Amazon. Go here to look at it. I was sad to learn that Dr. Parish passed away in 2002. Go here to read his obituary. He left a magnificent piece of Civil War scholarship behind him that deserves to be better known. Put it in my cart for homeschooling. Something good enough to impress you on this subject has gotta be good. Just discovered your blog and as a fellow Civil War historian, I am so glad you discovered Parish. If I might I would also recommend to you his excellent collection of essays, *The North and the Nation in the Era of the Civil War. * He adds greatly to our understanding of how Northerners’ political and civic convictions were that the survival of their local, free institutions were threatened by the growth of the national “Slave Power.” Pax Christi. Thanks for your recommendation Thaddeus.